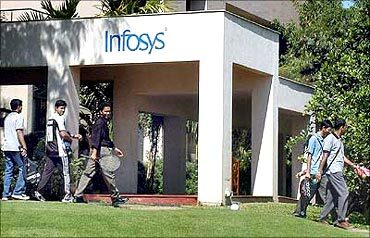 Youngsters looking to settle abroad, especially the US, by working in the IT industry should opt for career growth within India, which offers larger growth opportunities than anywhere else in the world, Infosys mentor N R Narayana Murthy said. "Somehow our youngsters have all assumed the idea of joining this industry is to go to US, get there, get an H1B, convert it into green card and settle down there. I think it is a wrong solution, a wrong strategy," he said. 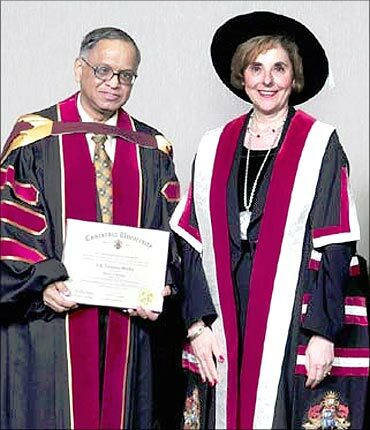 Image: Infosys mentor N R Narayana Murthy. Murthy said one expects youngsters to get good salaries and good disposal of income in India, for which they have to get good quality jobs here. "But their objective cannot be to go and settle down in some other country, especially the US." "This time you have a great opportunity to consolidate and by working in India, by becoming a good quality professional you will sustain the advantage we have created and will make growth in India a permanent rather than a temporary feature." On wooing back Indian talent, Murthy said there was no need to increase their salaries by 50 times to ensure this. But their lives could be made easier by providing schools, making sure that power condition and commuting is reasonably all right. "This is being done by many countries in the world. This is nothing new. This is not rocket science," he said, adding there must also be attempts to ensure that the facilities are enhanced. "I think all state governments must make an attempt to say we will allow as many English medium schools as required because if you do not do so, then the children will not be able to move from one state to another." Job opportunities available to children who go to English medium schools generally are seen to be of a higher quality and is a reality whether one likes it or not, he said. To get these section back, the combination of financial income coupled with comfort of living in India and with the family should be higher than the financial income and discomfort living abroad, he said. 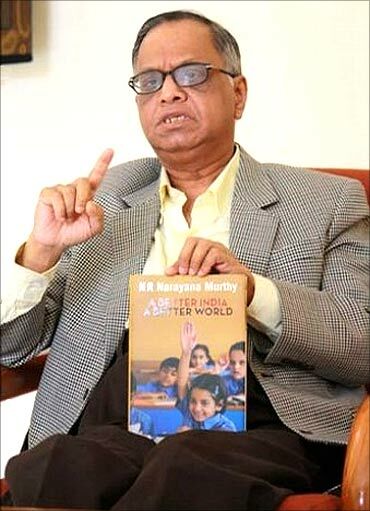 When asked what his priorities would be if his name was proposed for the President's post, Murthy said: "In a parliamentary democracy like India, President is a ceremonial post. That is the reality."